Barrett’s oesophagus refers to metaplasia of the oesophageal epithelial lining, whereby normal stratified squamous epithelium is replaced by simple columnar epithelium. The prevalence ranges from 0.5-2% in the Western world. Around 10% of patients with gastro-oesophageal reflux disease (GORD) will have already developed Barrett’s oesophagus by the time they seek medical attention. In this article, we shall look at the causes, clinical features and management of Barrett’s oesophagus. Metaplasia is the abnormal reversible change of one cell type to another. 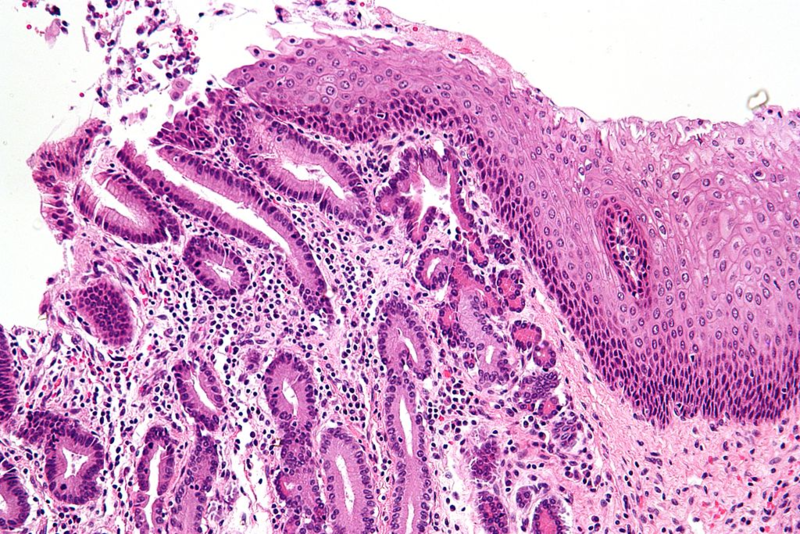 In Barrett’s oesophagus, the normal stratified squamous layer of the oesophagus is replaced by simple columnar (glandular) epithelium (as present in the stomach). The vast majority of cases are caused by chronic gastro-oesophageal reflux disease. The epithelium of the oesophagus becomes damaged by the reflux of gastric contents, resulting in a metaplastic transformation. This in turn increases the risk of developing dysplastic and neoplastic changes. The distal oesophagus is most commonly affected. Diagnosis relies on biopsy, demonstrating the presence of simple columnar epithelium within the oesophagus. The typical presentation of Barrett’s oesophagus is a history of chronic gastro-oesophageal reflux disease. Features include retrosternal chest pain, excessive belching, odynophagia, chronic cough and hoarseness. Examination will be unremarkable in cases of solely Barrett’s oesophagus with no further complications. Barrett’s oesophagus is a histological diagnosis. Patients who undergo OGD for chronic or resistant GORD (or to exclude malignancy) should have a biopsy taken of the oesophageal epithelium and sent for histological analysis. At OGD, the oesophagus appears red and velvety in cases of Barrett’s oesophagus, with some preserved pale squamous islands. Figure 2 – The endoscopic appearance of Barrett’s oesophagus. All patients with Barrett’s oesophagus should be commenced on a proton-pump inhibitor (typically high dose and twice daily). Any medication that impacts the stomach protective barriers (such as NSAIDs) should be stopped. In addition, the patient should be provided with lifestyle advice to reduce the acidic stimulus on the squamous cells. The major risk of Barrett’s oesophagus is progression to adenocarcinoma. Therefore, all patients with confirmed Barrett’s oesophagus must undergo regular endoscopy (Table 1). The frequency of this depends on the degree of dysplasia identified by the biopsies (if any). Low grade dysplasia Every 6 months Repeat endoscopy with quadrantic biopsies every 1cm. There is no consensus on long-term surveillance in this group. High grade dysplasia has a high risk of progressing to cancer so should be resected with endoscopic mucosal resection (EMR) or endoscopic submucosal dissection (ESD). Adenocarcinomas detected on routine screening for Barrett’s oesophagus are typically early-stage lesions and have a better prognosis than those discovered outside of any screening program. Which of the following correctly defines Barrett’s Oesophagus? A patient is diagnosed with Barrett’s Oesophagus and biopsy's show no evidence of dysplastic cells. How often should the patient undergo routine surveillance endoscopy?